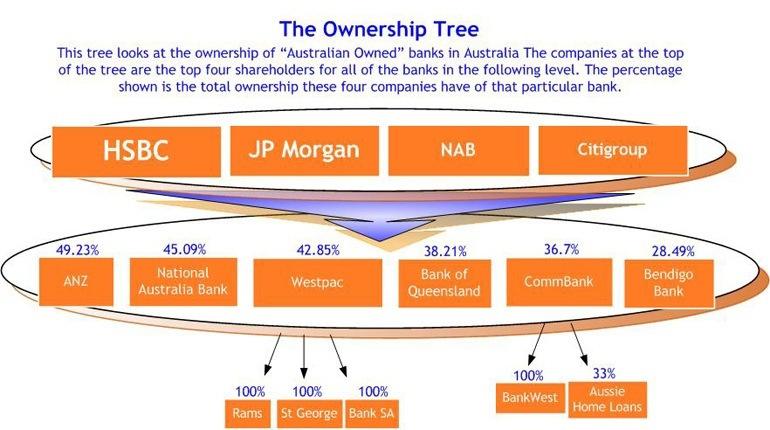 What do Australia’s “Big 4″ banks have in common? 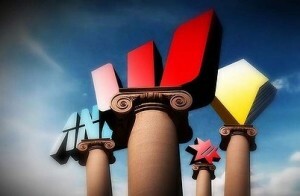 NAB, ANZ, Westpac & Commonwealth Bank are publicly listed companies. So that means they have shareholders right? Well did you know that the top 4 shareholders in each of the Big 4 are in fact the same? Startlingly, smaller competitors like St. George and Aussie Home Loans – who claim to offer consumers a “fair go” – are also subsidiaries of the same corporate giants. The above information can be gathered from the annual reports of these banking giants. But these figures are not made readily available to anyone with internet access and a few search engine terms. No, the banks use measures such as publishing these details in image format, tucked neatly away on their websites so as not to be found by search terms or even Google’s tentacles. Search engines only search for text, so an image file saved under an innocuous name won’t be found by prying eyes, whereas the same details loaded into a table on a their website would. Just think about how many ads you see for all these banks on television, in the newspaper on the radio and all over website banners (among other places) all pushing their products, promising theirs is the best and that your money is better invested – or should I say spent – with them. It’s a farce. A lie. A giant con. The Big 4 Banks would have you believe that they’re all competing with each other, and in that spirit of competitiveness, giving you the power to choose a product best suited for you over the others. This power never existed. 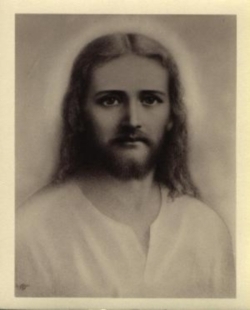 You were given the illusion of power. It’s a clever technique employed by big corporations to get you to do exactly what they want; consumers are led to feel that they have a choice based on clever marketing tactics when really the choice has already been made for you. The big banks are in fact colluding in order to retain the power you thought you had. The numbers are stacked against you and the house always wins. Don’t be fooled into thinking just because the bank CEO’s are earning multimillion dollar pay packets that they are “in charge”. They are there at the behest of their majority shareholders to do their bidding, as they control the majority voting power. It’s the majority shareholders that have power, the real power to control the bank and everything it does. So scroll back up and double-check just who these corporations are that own the “Big 4″ in Australia. I’ll let you do your own research as to who actually controls these 4 global financial powerhouses. At the time I received this reply it actually put me at ease, as I was on a bit of a crusade to prove it was owned by the British Royal Family. So back then no alarm bells were going off for me on that one and the trail went cold, so to speak. Now, when I think about those words – “The Reserve Bank of Australia is wholly owned by the Australian Government” – I get a sinking feeling in the pit of my stomach. For those who follow my website realnewsaustralia.com you will remember a piece I wrote entitled OPPT, Banks, Governments, Corporations and You. In that article I talked about how the Australian Government is actually a corporation that is registered with the Securities Exchange Commission in Washington D.C.
Got that sinking feeling yet? The ‘COMMONWEALTH OF AUSTRALIA’ corporation is masquerading as legitimate government, and by their own admission actually owns the Reserve Bank of Australia! Here we see the highest form of collusion to create an elaborate illusion for the Australian people, all for the benefit of power-broking shareholders. Never mind “the man behind the curtain”. Lee “General” Maddox is the founder of realnewsaustralia.com, a site dedicated to offering an alternative view to government-controlled media, and helping people to challenge and question what they see on TV, read in newspapers & hear on the radio.